There are lots of products available for cats, and it can sometimes be confusing determining whether a specific one is necessary for your cat or not. If you're looking at a pet water fountain and trying to decide whether it could help your cat, this information is important. Cats evolved as desert animals, and as a species, they continue to have a low thirst drive. Wild cats get most of their water when they eat their prey and don't necessarily need to drink a significant amount beyond that. However, the dry food diet that many indoor cats eat doesn't provide enough moisture, and many cats are chronically dehydrated, which can cause or exacerbate illnesses like urinary tract problems and kidney disease. When outdoor cats do drink water, they prefer finding sources that are trickling or running rather than stagnant pools. During their evolution, cats probably learned that stagnant water sources were more likely to make them sick. Our housecats still have this innate knowledge, so drinking out of a water bowl is not ideal for them. 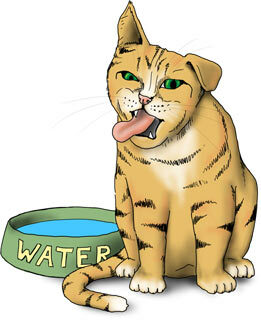 Cats are extremely sensitive to tastes and odors, and that can negatively impact how much water they drink. Tap water with its chemicals and the bowl itself might have odors or flavors that cause a cat to avoid drinking. A water fountain with a filter can resolve this issue, providing odor and flavor-free water for your cat. 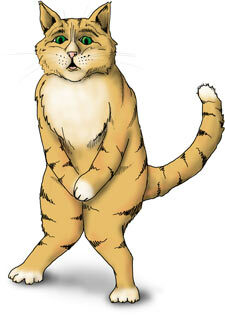 Your cat has a chronic medical condition such as recurrent urinary tract problems or kidney disease. 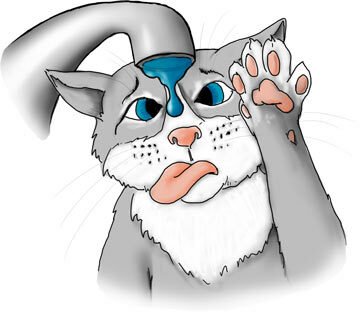 Dehydration exacerbates these issues, so getting more water into a cat that is suffering from them is a top priority. 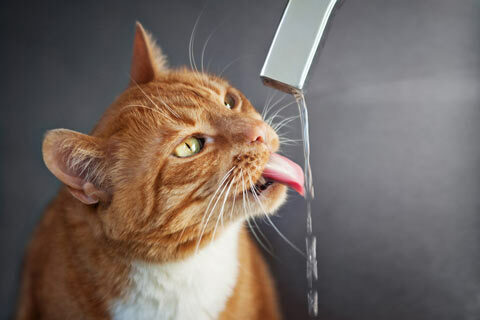 Your cat routinely jumps on the counter to try to get a drink from the faucet or climbs in the shower to lick up water after you get out. This behavior indicates that your cat is looking for running water or a fresher source than she considers the water in her bowl to be. Your cat bats at the water in the dish with a paw before settling in to drink it. When your cat bats at the water in her dish, she is trying to get it moving. Your cat looks unhappy with the water bowl, perhaps walking up to look at it and then walking away throughout the day. 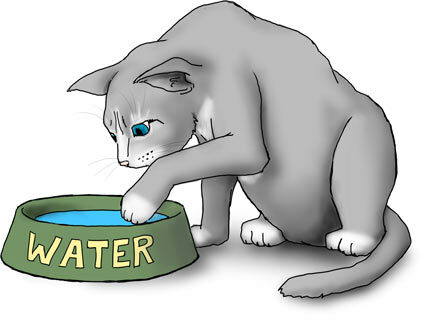 A cat that routinely "checks" her water bowl but leaves without drinking might be upset with its quality or stagnant nature. If your cat is engaging in any of these behaviors surrounding her water, a pet water fountain might encourage higher water consumption. They are ceramic. The drinking surfaces of the Pagoda and Seascape are ceramic, which doesn't scratch. Scratches that occur in plastic bowls can hold on to odors and bacteria. They have wide drinking surfaces. Cats often dislike deep, narrow food and water bowls which can push painfully back on their whiskers when they eat or drink. Drinkwell fountains have nice wide drinking areas that don't affect a cat's whiskers. Their constant water flow inhibits bacterial growth. The perpetual running of water through the fountain makes it more difficult for bacteria to set up shop than in a bowl of standing water. Their filters remove bad tastes and odors. The water in the Pagoda and Seascape is always being run through a filter that removes most odors and tastes that might keep a cat from drinking. The filters are replaceable, so you can always ensure the greatest water purity. They're beautiful. The sound of the water trickling through the Pagoda or Seascape is soothing to the humans in the home, and both fountains are beautiful, too, which makes it easier to incorporate them into your décor. Once you've chosen a water fountain, read the instructions and set it up in a prominent area of your home. Cats in the wild drag their food away from their water source, so it's best to set the fountain up across the room from any food dishes. Don't remove your cat's previous water source right away. Cats sometimes need to warm up to new things for a bit, so it's important that your cat can still go back and get water from her old dish if she wants to. Once you see your cat reliably drinking from the fountain several times per day, you can remove the old bowl.